“Asian” Noodle Bowl! | I Am Not A Restaurant! Let's just say I sometimes know how to get the kids to eat their veggies. By calling the soup “Asian” I had their full attention and palates. I do sometimes wonder though if they think the country of “Asian” includes that entire side of the Pacific rim, minus Japan, the holy grail of sushi! And I realize that by offering a mash-up of countries and cuisines in one bowl I am perpetuating the problem. I don't care-I still got them to eat broccoli, mushrooms and sugar snap peas. I also laid on the spice with a favorite fermented hot sauce and enough extra soy to numb their tongues and bloat their ankles till Friday. Btw – tomorrow's ribs are in the oven as we speak. I caught a Bon Appetite recipe on my way home and couldn't help myself. Rub, Braise, Cut, Reheat. 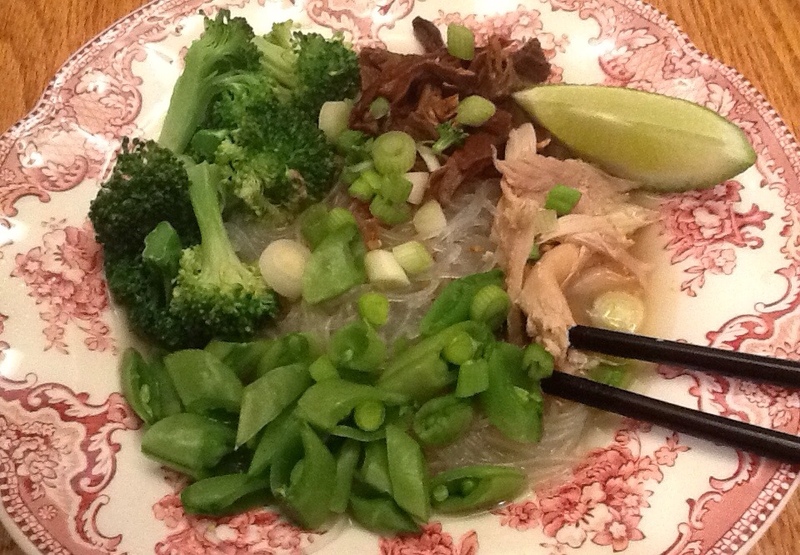 Jan23January 23, 2013 • By Betsy Karetnick • This entry was posted in Dish of the Day, Kitchen Help, Recipes and tagged Asian noodles, chicken, Nancie McDermott, rice noodles. Bookmark the permalink. That is a beautiful bowl of soup. I will need to try this. I don’t have kids to feed but my husband is happy to have something out of the ordinary. We do get into a rut over the winter.